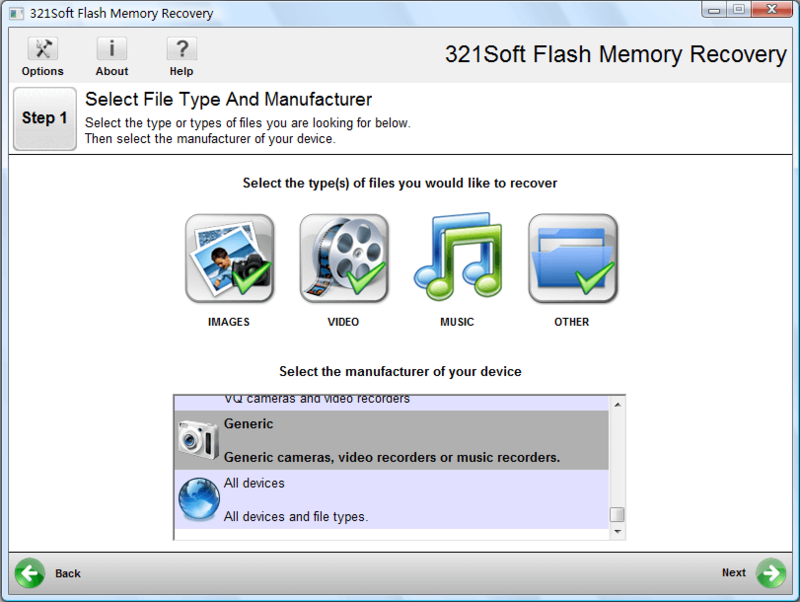 321Soft Flash Memory Recovery is the perfect data recovery solution for all types of media including USB Drives, Memory Cards, CD's and DVD's, and almost any other type of digital device that uses flash memory. The software interfaces are consists of several dialogs by step-by-step wizards mode to guide the user go over the whole work of data recovering. Regardless of whether you accidentally deleted a photo or memory card corruption, even your flash drive got formatted, Flash Memory Recovery will be able to help you retrieve those files instantly. Compared with other photo recovery products on the market, 321Soft Flash Memory Recovery has important advantages. It can recover not only photo, images and video files, but also office documents, music, spreadsheets, archives, and other erased data. Additionally, it recover RAW digital photos that are generated by professional DSLR cameras like Canon, Nikon, Olympus, Sony, Pentax etc. it also supports recovering high-definition video formats. 321Soft Flash Memory Recovery is a No risk data recovery application and will not write or make changes to the drive it is recovering from. Throughout the recovery process, it uses a read-only mode to scan and find files in your drives or devices. Ability to preview files before recovery, Burn recovered data to CD/DVD using the built-in burning software.